Occasionally Georges Simenon wrote novels and short stories at the location in which he set them. For example, in October 1937 he booked into the Hôtel de l'Europe in Port-en-Bassin (Calvados) in Normandy in order to write "La Marie du Port" (Chit of a Girl / Girl in Waiting), which he set in that very fishing port. And whilst living in the United States it was in Tucson (Arizona) that he wrote the novel "La Jument Perdue" (The Lost Mare  not translated) in October 1947, and later again in Tucson, in July 1949, the novel "Maigret Chez le Coroner" (Maigret at the Coroner's / Maigret and the Coroner). And there are others, including "La Tête d'un Homme". Although the storyline moves around Paris and outside the city to Nandy (Seine-et-Marne), Simenon chose to write it in the Montparnasse area of Paris in March 1931, at the Hôtel Aiglon, 232 Boulevard Raspail, on the corner with the Boulevard Edgar Quinet in the 14tharrondissement [quadrant 16 on the map]. (This hotel is still operating today under the same name and at the same address). 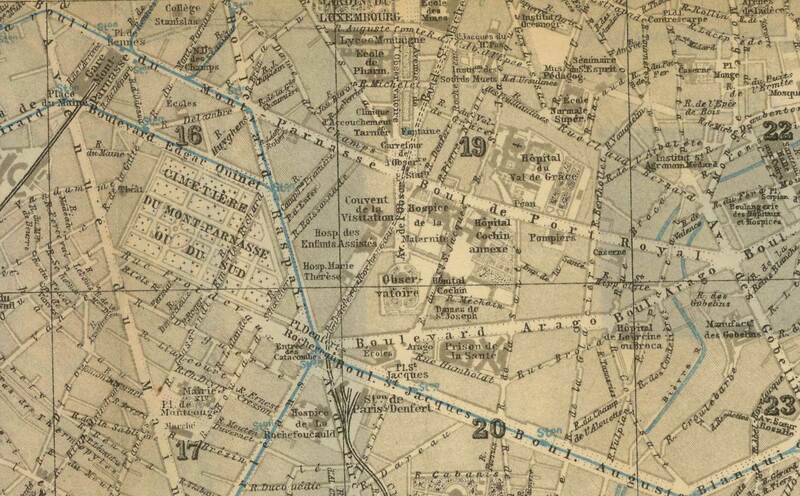 The map (from Paris and its Environs, Baedeker, 1924) shows many of the thoroughfares and establishments cited in the novel. Close to the intersection of the Boulevard Raspail and the Boulevard Montparnasse is the Rue Vavin. It was at number 33 in "La Boule Blanche" nightclub during the night of the 20th to the 21st of February that two of the first Maigret novels, as well as Simenon's name, were launched at a reception entitled the Bal Anthropométrique. Not far away is the Prison de la Santé bounded in the shadow of its high walls by the Boulevard Arago, the Rue de la Santé, the Rue Humboldt  now the Rue Jean Dolent  and the Rue Messier. Also near is the Place Denfert-Rochereau with its sculpture of the Lion of Belfort, the Montparnasse Cemetery and the railway terminus. At number 102 Boulevard Montparnasse, near the intersection with the Boulevard Raspail, is located the large brasserie and restaurant La Coupole, which is one of the focal points in the novel. This establishment opened on the 20th of December 1927 (and is still operating today) to acclaim and it attracted many customers and personalities. The basement catered for those who wished to dance, whilst the restaurants were on the first and second floors. On the ground floor was the American Bar where in the novel Maigret first encounters Johann Radek. 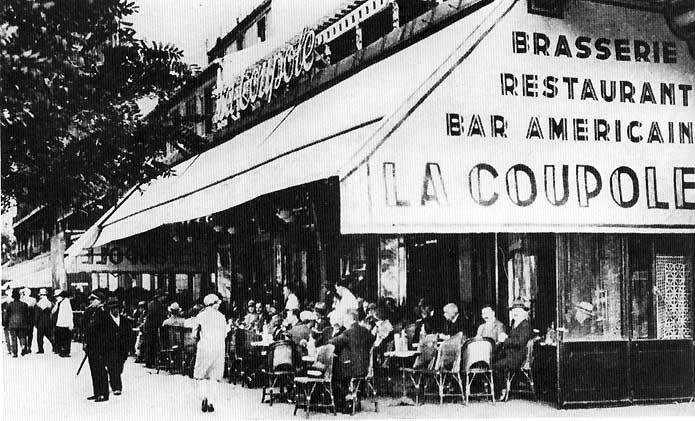 An early photograph of LA COUPOLE at 102, Boulevard Montparnasse, Paris. (When La Coupole opened the head barman in the American Bar was one Bob Lodewyck whose first name Simenon retains in the novel). Unfortunately to date there is only one English translation, that of the wayward Geoffrey Sainsbury who was often inclined to change some of the author's details. In this novel, the American's surname is changed from Crosby to Kirby and for Joseph Heurtin's wandering through Paris during the night, he substitutes the Palais Royal for the bustling central market, Les Halles. Small details, but why change them? Basically the novel centres on three very different people, Joseph Heurtin, who worked at delivering flowers on his tricycle-van, has been convicted of the murder of Mrs. Henderson and her maid, the American William Kirby (Crosby), nephew of Mrs. Henderson, enjoys the rich life style, but is not all that he seems, and Johann Radek from Czechoslovakia and a former medical student. Paying a visit to the American Bar at La Coupole, Maigret meets up with all three. Heurtin, on the run after being allowed to escape from the Santé prison, appears outside the Bar, being drawn to someone inside, William Kirby (Crosby) enjoys the atmosphere with friends, whilst Radek quietly observes all that is going on around him in the Bar. Simenon develops the theme where Radek manipulates the other two in different ways, praying on their weaknesses and being driven by his own megalomania brought about by his resentment of his poor background and his inherited fatal illness. Maigret intuitively and gradually breaks through the skein of deceit and the psychological games of Radek in order to reach the truth. 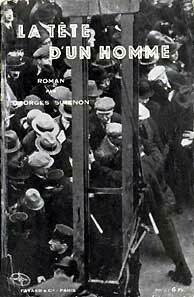 Do you know why this Maigret was printed in French with two different titles: La tête d'un homme / L'homme de la tour eiffel [A Man's Head ~ The Man on the Eiffel Tower]. Does the latter come from the movie? 5/04/04  The book called "L'homme de la Tour Eiffel" is what we would now call a spin-off from the movie, the original retitled to capitalise on the novelty and popularity of the film. The actor on the cover of the book (above left) is the star of the film, the English actor, Charles Laughton, best known perhaps for his portrayal of Captain Bligh in Mutiny on the Bounty. The DVD of The Man on the Eiffel Tower is quite easily available on Ebay, usually packaged with some dreadful British films of the same era. 5/04/04  Jérôme has raised some interesting points (above, 5/02/04). The reprint of La Tête d'un Homme that the Librairie Arthème Fayard published in 1950 is a way of cashing in on the film that was released on the 8th of January 1950 under the title of L'Homme de la Tour Eiffel (The Man on the Eiffel Tower). 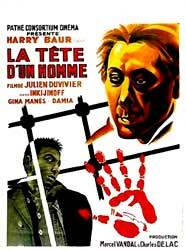 I saw a cinema showing of this film a few months ago, which was based on the main idea contained in La Tête d'un Homme. Maigret was played by Charles Laughton, Radek by Franchot Tone, Heurtin by Burgess Meredith (who also directed the film), William Kirby by Robert Hutton and his wife by Patricia Roc. Charles Laughton directed some of the exterior scenes shot in Paris. Like the earlier film version of 1932 directed by Julien Duvivier, with Harry Baur as Maigret, the later film deviated from Simenon's original text. 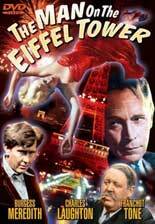 The climax of the 1950 film version took place as a chase up the structure of the Eiffel Tower involving Radek, Heurtin and the Police. 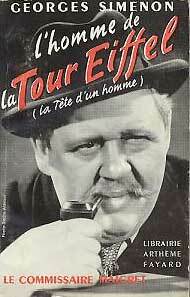 The front cover of the Fayard 1950 reprint is of Charles Laughton in the role of Maigret. ...But the conflict between Simenon and the film industry went deeper. Individualistic novelist and solitary creator that he was, he was uncomfortable with the collective efforts and industrial procedures inevitably entailed in filmmaking. The ponderous chain of production annoyed him. Too many people had something to say about how the film came out. He was horrified by the sums of money and numbers of people involved and disoriented by a human and economic organization whose functioning eluded him. When he wrote a book, he was the sole master. When a film was made of one of his books, his role shrank steadily as the date of shooting approached, until finally he was the fifth wheel on the cart, a condition that finally seemed aberrant to a man who was used to being the center of his own universe and the heart of his own production system. It was especially unpleasant for him to confront it for the first time just when his recent but promising success had fanned his most sensitive traits: vanity, egocentrism, and boastfulness. Simenon was a stubborn man resistant to allowing his own personality to be dissolved in a project based on a gathering of talents of diverse origins. It was his book, his screenplay, his script  and therefore his film. Even after collaborating on two screenplays, he did not understand that the director had to present in images what the writer tends merely to suggest in words. To depict without demonstrating, to suggest without describing, to be faithful to the spirit but not the letterall this seemed inconceivable to him. He refused to admit that adapters might have to take liberties with the novels on which their films were based. He therefore decided to make his own movies. He believed that if he had learned to write by doing it, there was no reason why he could not learn fimmaking the same way. He would flout norms, schools, and rules, trust his own intuition, genius, and whims. Most of all he would get rid of all those irksome intruders who constantly urged him to modify, correct, add, or delete on the basis of criteria he did not share. Some warned him of the difficulty of the enterprise and of the technical expertise required by this craft of which he knew nothing. He refused to listen. He made the proud announcement of his plans in an interview with Paris-Midi. "Only the author can judge how his novel must be incarnated," he declared, adding that while he would merely oversee the production of Le Charretier de la "Providence" (1931), he would be completely in charge of La Tête d'un homme (1931). In April, after writing Le Fou de Bergerac (The Madman of Bergerac, 1932) at the Hotel de France in La Rochelle, he moved to the nearby La Richardiere, a sixteenth-century manor house between Nieul and Marsilly. He fell so in love with the place that he tried to buy it immediately, but the owner rejected his offer, and he had to be content with renting. It was in these surroundings that "his" film was to be born. 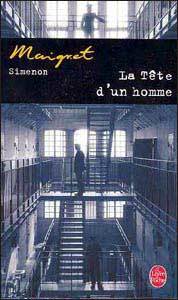 La Tête d'un homme was atypical in that it pitted Maigret against another major character, the murderer himself, who competes with the inspector in unraveling the threads of the investigation, thereby hoping to demonstrate his Machiavellian intelligence, unfairly overlooked by society. The murderer in question is a twenty-five-year-old medical student of Czech origin. The character was inspired by Simenon's friend Ilya Ehrenbourg, a Jew form Kiev who, like the author, was a regular at La Coupole. Though he fled the Soviet regime, he had earlier participated in the 1905 revolution, and the police therefore regarded him as a Bolshevik propagandist. Once in Paris, he became a poet, write, and journalist  the prototype of the exiled foreign intellectual. Simenon's murderer had many points in common with Ehrenbourg, and to top it off he gave him the name Jean Radek. This was a clever touch: Karl Radek was a member of the Central Committee of the Soviet Communist Party and the presidium of the Comintern. Several years later he would be expelled on charges of Trotskyism. Simenon wanted Pierre Renoir to play Maigret again. He was the right man for the role, and his mere presence in the film would suggest to audiences that the films, like the books, were part of a series. Radek would be played by Valéry Inkijnoff, a Russian actor with Asiatic features who had recently been featured in Le Capitaine jaune. Simenon thought of everything, including the promotion of the film, which for the moment only existed on paper. When he invited Inkijinoff to his house in Charentes to work on the script, he made sure to alert a photographer from the movie magazine Pour vous. The subsequent article struck just the right tone: two pipe smokers walking dogs in the countryside, chopping and sawing wood, and most of all brainstorming  conceiving, writing, and dictating to a secretary what would surely be the film of the year. In the end, alas, the film industry prevailed over Simenon's desire to go it alone. As he tells it, crooked producers paid him with rubber checks, thus forcing him to abandon the project. Perhaps the results of his cogitations in Charentes struck them as too amateurish and therefore too risky. One way or another, a furious and disgusted Simenon was forced to pull out. Marcel Vandal and Charles Delac, producers at the Films d'Art company, then assigned the picture to Julien Duvivier, a seasoned director with some thirty films to his credit, including several literary adaptations. With Duvivier there would be no unpleasant surprises. He kept Valéry Inkijnoff on in the role of Radek, but dropped Pierre Renoir in favour of Harry Baur, who would make a sober, taciturn, and physically powerful Maigret. He abandoned the existing script and asked Louis Delaprée and Pierre Caldmann to write another. Simenon wanted nothing more to do with this film or with films in general. Two commercial failures and his own aborted project convinced him that he would be boycotted by the industry, a prospect that did not concern him unduly. He expected his work to endure, and he was sure the movie companies would one day rediscover him, if only out of simple common sense: "…the cinema, abandoning its routines and repudiating its laws and prophets, will feel the need to assimilate the aesthetics of the novel, to delve into psychology, to come closer to man while stepping back from intrigue and from the theatrical clichés which have already half-mummified it." When that day came, filmmakers who had learned to live with freedom would work unfettered. They would make movies the way he wrote. Until then he would renounce films. If he could not make "his" great picture, he would refuse to allow anyone else to make it in his place. Film rights to his books were no longer for sale, a boycott that would last for seven years. But the false start had not been a total loss. He had made as fair amount of money, a hint of what he could get from the cinema if ever he decided to bow to its laws. "From the first Maigrets, the movies were a good fairy to me," the memorialist would later acknowledge. ... In 1931, movies were his second biggest source of income (75,000 franc), after the Maigret novels published by Fayard. If we take into account the financial resources the Simenons needed for their extravagant lifestyle, we get an idea of the strength of principle required to keep his inspector off the screen, albeit temporarily.